2016’s The Obelisk Gate is a direct sequel to 2015’s The Fifth Season and is the middle volume in N. K. Jemisin’s Broken Earth trilogy. The Fifth Season was nominated for the Hugo, the Nebula, and the World Fantasy Award. It was also listed on the 2015 Tiptree Long List 1. Any sequel is certain to face some high expectations. This book lived up to mine; whether or not it will live up to yours is unclear. It’s some months after the end of the world. Ripping a super-continent in half was just the beginning of Alabaster Tenring’s plan. Since he won’t live to see his grand scheme to fruition, he needs someone to take up his role. Essun has the potential. Since her daughter Nassun seems forever lost to her, Alabaster figures that he can give her a new goal. Alabaster harnessed far more power than any other Orogenes, those with the ability to manipulate tectonic forces through will alone, because he was armed with something other Orogenes are deliberately denied: information about their abilities and knowledge about the true history of the world. What he knows, he can teach Essun. She could use it to end the endless exploitation to which she and her follow Orogenes are subjected. To do that, Essun and her allies need to stay alive. That could be tricky. Alabaster’s rift has triggered another Fifth Season. As vents spew poison, as dust clouds blot out the sun, a mass extinction of unusual duration is inevitable. Not only is the Fifth Season itself nearly impossible to survive, it provides the perfect cover for a hidden faction to eliminate people like Essun, people whose powers are seen as an unwanted complication in a dire time. Nassun is half a continent away, miraculously still alive despite her father Jijo’s murderous hostility towards Orogenes like Nassun. Jijo beat Nassun’s brother to death the moment the infant inadvertently revealed that he was an Orogene; Nassun he spared in the belief she could be cured. Which actually means handing the girl over to people whose job it is to break and domesticate people like Nassun. People who will see in Nassun not a tool but a weapon. If you are looking for some light, comforting fantasy to read at the beach, this is probably not a good choice. Not unless you enjoy reading a book that begins with a world plunged into catastrophe and ends with the possibility of a world destroyed. Not unless you enjoy reading about people doing terrible things to each other, generally in the name of the greater good. Which claims are sometimes genuine, sometimes cynical exploitation of fear. This is clearly marketed as fantasy and the word magic appears in the text. There are people made entirely of stone popping into the narrative, while the Big Bad of the book is even less mundane than the stonemen. Despite all that, this book still reads more like science fiction, good old rock hard SF, than it does fantasy. I had a lot of unanswered questions when I finished The Fifth Season. The Obelisk Gate answered more than a few, while still leaving room for a third (final?) volume. That’s because the answers themselves raised more questions, not least of which is whether or not burning down the world will turn out to be a sensible response to an ugly state of affairs. Like I said, not a comfort read. 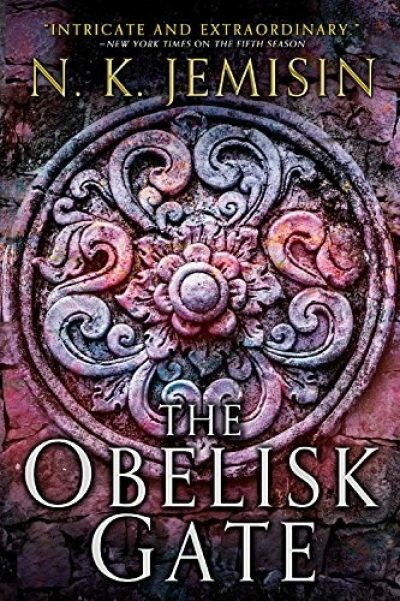 The Obelisk Gate is available from Orbit. For me, I mean. You guys will have wait until August. Try not to burn the world down before then. 1: Which ISFDB calls an honorable mention because the ISFDB isn’t great at getting the minutiae of the Tiptree Award correct.